Described as The Office meets The Bible, the tale told here is hardly to be believed. The Question: What happens when God and Mammon are made to synergize? 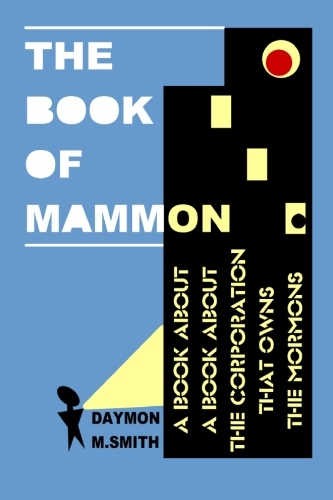 In answer, this book opens the doors to Mormon corporate offices, most secret of spaces, and invites you inside. At the Church Office Building (it’s actual name) spiritual ambitions speak through HR evaluations, missionary mission statements, digital converts, and scripture marketing campaigns. Hear employees chant “cultural beliefs” and test if a new DVD hits your “spiritual hot buttons.” Watch us market food storage “solutions” to religious consumers! Read about the “best practices” of the corporate side, from smuggling underwear into banana republics to Mitt Romney’s role in a billion dollar Church Mall. The author, an Ivy League trained cultural anthropologist, “works” (sometimes) as a media evaluator with the Mormon Church’s corporate arm. During long lunches he traces the ins and outs of a religion being consumed by corporate culture, and you, Dear Reader, are invited along for the insights, laughs, and revelations. A compelling, light-hearted but serious memoir, sometimes fictional ethnography, and, yes, even apocalypse, this book crosses genres, fact, fancy, and everything between. Not for the faint of heart. In this book, pg. 99 in my kindle version there is reference to Guarani which it says in parenthesis is an indigenous language of Brazil. It’s actually an indigenous language of Paraguay. I served a mission there and suffered for two endless years with that language which still brings back unpleasant memories. It’s considered one of the official languages of Paraguay and is spoken in the home but no one reads it as Spanish is the other official language. The church books printed in guarani never get nor got used. The only people who wanted them (or could read them for that matter) were the missionaries. And they only wanted them as missionary souvenirs. They’ll easily recoup the 84 bucks. Loved this book by the way! thanks for the correction, you are totally right, and I should have known that. It’s always nice when readers read carefully enough to find errors (seriously). Glad you liked it. Guarani is spoken in Argentina, Brazil, Paraguay and Bolivia according to Wikipedia.